Normally, I won’t even consider a credit card sign up bonus offer unless it’s in the 40,000-50,000 point range. On average, 1 point is worth at least 1 cent so if you can score 50,000 points that means you just earned yourself $500. I make good money at my day job but I still know that it takes a lot of work to make $500 after taxes. If I can spend a few minutes applying for a credit card and make $500, that seems almost too good to be true. You might not always be able to get $500 in cash though. Sometimes it’s $500 in gift cards, airfare or even hotel rooms. But if you were going to spend that money anyways, $500 is $500. Plus, that money is tax free which makes credit card sign-up bonuses one of my favorite things in this world, yes the world. It’s definitely a lot of work to track and manage 30 cards but for me it’s kind of like a hobby. Most people though are probably better served with only a few cards in their wallet. But that doesn’t mean you can’t sign up for a great offer like this and cancel the card after a year. It probably takes no more than 20 minutes a year to manage three extra cards so you tell me if your time is worth $1,500 or not. And if you sign up for this card, you’ll actually be able to redeem for a hell of a lot more than $500. Let’s see how. The Starwood Preferred Gold (SPG) Amex (and Business Card) is your run of the mill hotel chain card. There isn’t anything special about the actual card: it gives you a few extra bonus points when you use it to pay at a Starwood property but it doesn’t even have no foreign transaction fees. The one redeeming quality about the card is the points system. Starwood points are very valuable and they have over 30 airline transfer partners! I generally like to redeem Starwood points for hotel stays since their cash and points option can get you some insane redemption rates. 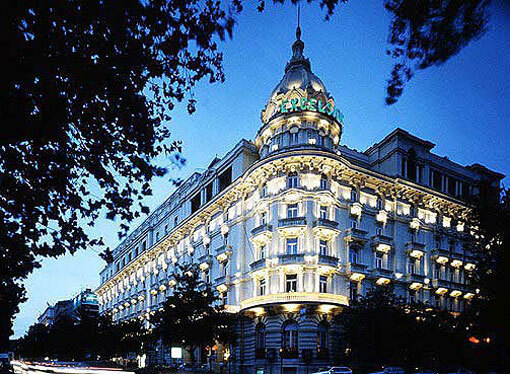 For my honeymoon this summer, I actually booked two different Starwood properties: The Westin Excelsior in Rome and The Grande Bretagne in Athens. These are two top of the line luxury hotels and I never would have been able to afford them without points. Ok that’s not true, I could definitely afford them, but I’m way too cheap to pay full price for them. At the time of booking, standard rooms at the Excelsior were going for $506/night but I used Starwood’s Cash and Points Option and paid only 10,000 points and $180 per night since the Excelsior is a Category 6 property. The total cash price would have been $1,012 but I spent a total of 20,000 points and $360. So my 20,000 points saved me $652 ($1,012-$360) which equates to 3.3 cents per point. At the time of booking (12/24/13 – yes I did book 7+ months in advance haha), classic rooms were going for about $376/night. The cash and points cost was only 6,000 points and $110 though since the Bretagne is a Category 5 hotel. The 3 night cash total would have been $1,128 but I booked 3 nights for 18,000 points and $330. So my 18,000 points saved me $798 ($1,128-$330) which equates to 4.43 cents per point! By now you should have realized the power of a Starwood point, it’s no ordinary point since you can easily get 3-5 cents per point redemptions. The bonus for this card is normally only 25,000 points after spending $5,000 in 6 months but for a limited time it’s been bumped up to 30,000 points. This is the highest I’ve ever seen this particular bonus and when you factor in the $5,000 in spending, you will end up with 35,000 Starwood Points. Depending on how you redeem those points, 35,000 points could get you anywhere from $1,050 to $1,750 in hotel stays for free. So if you’ve got a decent credit score, why on earth would you not apply for this card? The card even comes in a personal and business version so if you’re feeling real frisky, you could sign up for both and net yourself 70,000 Starwood points. If you’d like to sign up using my referral code, please shoot me an e-mail and I’ll send you the sign-up link. I get 5,000 SPG Points for every member that signs up using one of my links so it’s a great way to support the site. Readers, what do you think about the SPG card now that you know how valuable the points are? Have you ever stayed at a Sheraton branded property? That is a lot of money for a hotel, I am glad you can get them with points. But any place that expensive, even if the rooms are free, is too expensive to stay in for me. Everything costs more, food, snacks, etc. I am generally staying in the cheap seats, when I splurge it’s the Hampton Inn or similar. Yea that is definitely a good point, breakfast at this hotel is close to 50 Euros. We will definitely be heading to a local cafe around the corner for a 5 Euro breakfast 🙂 A lot of us travel hackers like to inflate the values we get from a point but if we were to pay with cash then we probably wouldn’t stay at such a nice place as you elude to so I guess it’s all how you look at it. That being said, if you like staying in the lower tier/category properties you can usually make your dollar go even further. The IHG card (Holiday Inn, Candlewood, etc) gives an 80k bonus plus 1 free night and nights at their lowest tier properties cost 15,000 points or ~$100 if you paid cash. So that would get you close to 6 nights or $600 in actual rewards from one credit card sign up bonus. Cancel the card after a year and you just made $600 tax free for about 5-10 mins worth of work. I think my issue with these types of cards is that I don’t want to use credit card rewards for something I wouldn’t otherwise spend my money on. I want to use credit card rewards to save money out of my budget, not to increase it. In that case, cash back cards are probably your best option. I kind of look at it the other way since I enjoy traveling and normally I would never pay for this nice of a hotel. If I sign up for a couple new cards and do all the prep work that goes along with it I can stay at a very nice property for the same amount I would have paid anyways. Thanks for the review, we’ve been looking at getting this card as our next one since we’ve heard that this one is a really good one for all of the reasons you’ve mentioned! We don’t ordinarily stay at Westins because of the expense, but with the kind of discounts that you’ve gotten we totally would go for it! Nice, I say go for it. I really like SPG properties, they’re always very nice but not overly pretentious/ritzy like some of the other top chains. Availability is a bit limited during peak times but you can get around that by booking in advance or using the points for off-peak travel. Let me know how it goes!